In a little over a week, nearly 100 Canadians will set off on an incredible, and incredibly important, seven-day cycling odyssey: the 2015 Wounded Warriors Canada Battlefield Bike Ride. The 555-kilometre journey begins at Vimy Ridge Memorial and follows the footsteps of Canadian WWI troops into Belgium and its historic Flanders Fields. From Bruges, the ride’s focus shifts to WWII and the major role Canadians played on the path to Victory in Europe as the world marks the 70th anniversary of VE Day and the liberation of the Netherlands. The ride ends in Nijmegen, Netherlands – the site of the only Canadian war cemetery in Holland. The purpose of the ride is to raise funds and awareness on behalf of Wounded Warriors – a not-for-profit organization that supports Canada’s ill and injured Canadian Armed Forces members, Veterans and their families and provides a spectrum of care focused on mental health (in particular, Post-Traumatic Stress Disorder). A member of my bike club is among the nearly 100 cyclists from across Canada who’ve met the minimum fundraising requirement ($4,000) to participate in the Battlefield Bike Ride. 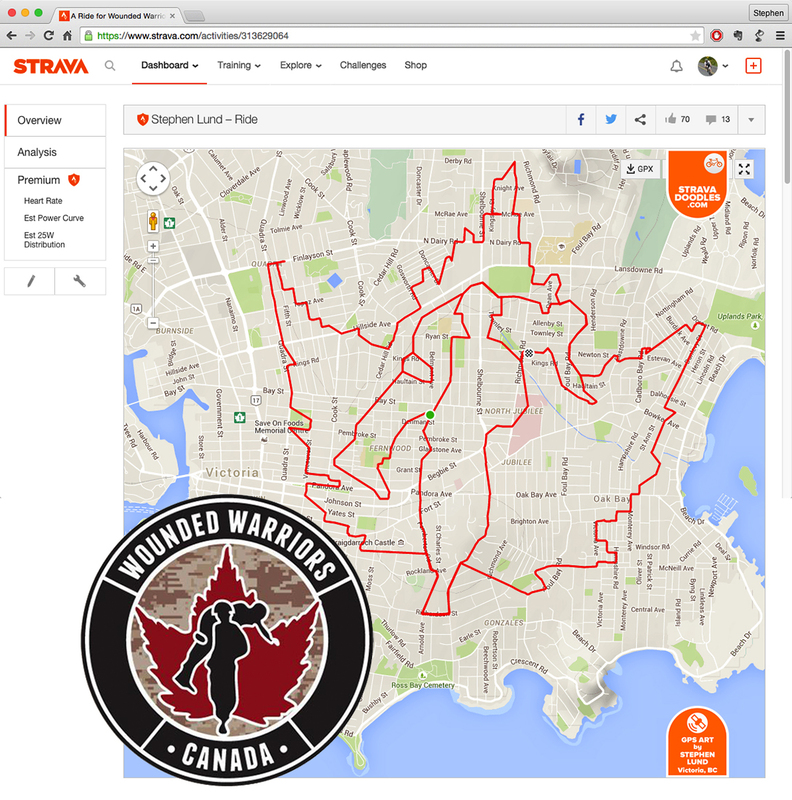 Over coffee after last Wednesday’s ride, he asked if I thought it possible to recreate the Wounded Warriors logo as a GPS doodle. While sketching the figures inside the maple leaf required a lot of Garmin OFF/Garmin ON dot-connecting, 90% of the maple leaf itself followed actual roads. 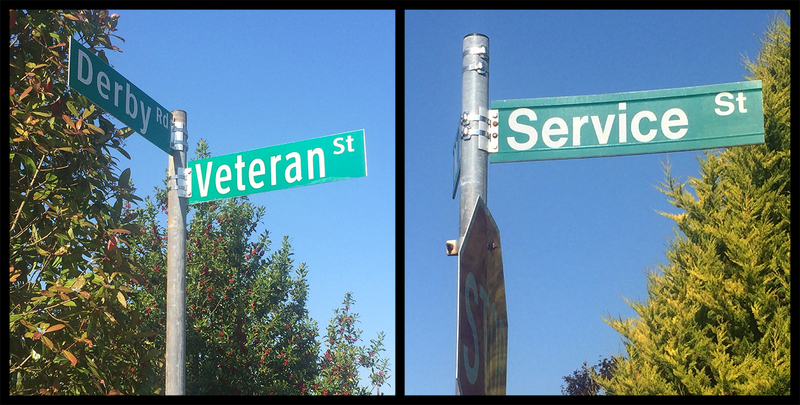 Notably, Veteran Street and Service Street form the top right edge of the maple leaf. To create this doodle, I cycled just shy of 60 kilometres. Veteran Street and Service Street form the top right edge of the maple leaf, adding a compelling dimension of thematic relevance to the GPS doodle. This entry was posted in gps art and tagged Battlefield Bike Ride, bicycling, Canadian Armed Forces, creativity, cycling, garmin, gps, gps art, logo, PTSD, strava, strava art, Veteran Street, victoria bc, Wounded Warriors. Bookmark the permalink.